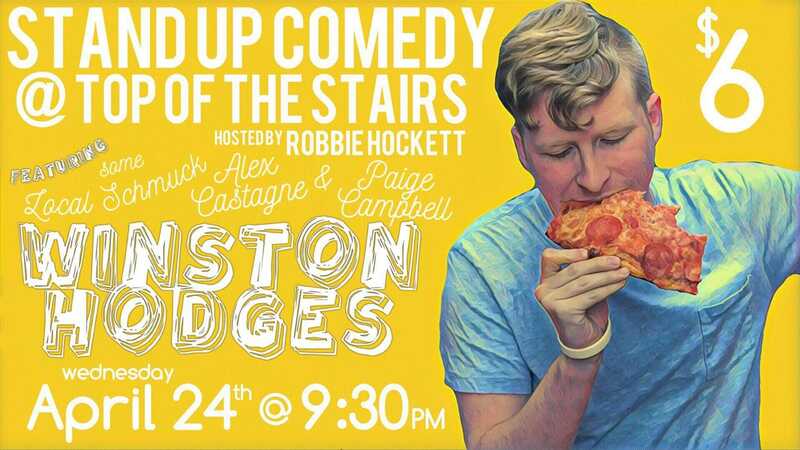 Top Of The Stairs presents Blacksburg Comedy Club featuring Headliner Winston Hodges and Friends on Wednesday, April 24, 2019. Winston Hodges is a fast rising comedian based in Virginia. Comedy Club features national and local comedians as well as a host who will kick the show off and set the mood for a night of laughs. Arrive early for parking and to ensure the best seats in the house. To view the event flyer, visit: https://i.imgur.com/KVYLpSo.jpg. For more information on the Blacksburg Comedy Group, visit: https://www.facebook.com/blacksburgcomedyclub/ or https://www.instagram.com/bburgcomedy/. For more information on Top of the Stairs, visit: http://www.topofthestairs.com or https://www.facebook.com/pages/Top-of-the-Stairs/57341525756 or call 540-953-2837.